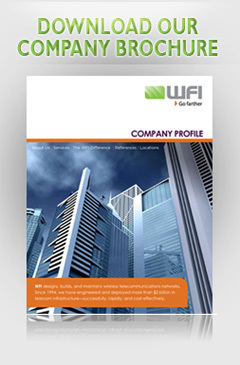 WFI provide personalised and customised infrastructure management solutions. Our services range from single solutions for defined network elements to the outsourcing of entire computing centres. We manage your specific IT requirements so that you can concentrate on your core business. Our team of highly trained specialists s provide efficient, effective, flexible and cost-effective management of your IT essentials that will give you peace of mind 24 hours a day, 7 days a week. The immediate benefits of working with WFI is that we will provide cost savings and reduced capital costs for your business. WFI brings the best in program management, quality assurance and technical expertise to network infrastructure design, deployment and maintenance. Since 1994, we have engineered and deployed more than $2 billion in telecom infrastructure – successfully, rapidly and cost-effectively. WFI will draw up a service-level agreement where the quality, availability, and responsibilities are agreed. This ensures optimum efficiency and security in the day-to-day running of your business with running IT costs fixed and calculable over an agreed period of time. We can recommend the best firewall set up for your business, provide the initial configuration and setting up of firewall plus on-going management of the system. To increase capacity and reliability of applications we can recommend, set up and prepare initial configurations for load balancers that decrease the burden on servers associated with managing and maintaining your application and network sessions. On-going maintenance is part of the package. WFI, offer Casino Infrastructure Management that allows for the remote management of essential online casino operations including policies, processes, equipment, data, human resources, and external contacts – in short we cover all needs any online casino site would need. WFI can be a single point of contact for all your managed services needs, with a specific technical account manager responsible for your project. From networking technologies to storage systems, from mobile terminals to operating systems and applications, we can provide you with the best recommendations on usage. We can install ethernet and/or fibre channel network switches and the configuration of network protocols that include spanning tree, port channelling, vtp, cdp, and zoneing. WFI support the operation and maintenance of all hardware and software, ensuring that all is optimised for your business needs. WFI monitoring covers usage, compliance, contract management, data backup via a maintenance support model that includes a help-desk, and remote support that contributes to the seamless running of your business processes. Our casino and bingo life-cycle infrastructure development programme is a portfolio of modular, innovative and sustainable services that ensure your systems are the best they can be. We work to make sure you will not be disrupted by unwanted downtime including disaster recovery concepts and measures. Bringing the latest technologies and services, WFI has what it takes to manage all facets of the wireless telecommunications infrastructure. We can offer a complete service for your casino/bingo business or you may wish to opt for support in specific areas. If you are replacing systems, WFI will take responsibility for asset removal and cleaning, license reclamation, lease management returns, salvage broker management, and EPA compliance. At WFI we understand the excitement of Casino Games and Bingo. With a strong track record, and first class service, our business has more than doubled in size over the last five years. And we are on a mission to continue to grow as we expand into Europe. WFI are proud to deliver high quality processes and technical solutions on a wide range of technologies and business processes in a hands-on manner and in a timely fashion. At WFI we make your software work for you. Our highly trained teams have the knowledge, skills and dedication to understand the strategic goals of your company and the challenges you face. WFI can be trusted to help you achieve goals, solve problems and deliver results.